Lent—la Quaresima in Italian—is the roughly six week period on the Catholic calendar between Ash Wednesday and Easter. Traditionally a period of self-sacrifice and fasting, in the old days the faithful were expected to abstain from eating meat and rich foods, and live on simple vegetable, fish and grain dishes. A whole range of simple meatless cookery—la cucina quaresimale—typified the season, with the individual dishes called piatti di magro, or ‘lean’ plates. Not many people observe the Lenten fast anymore, but that’s no reason to lose this unique school of cooking. These piatti di magro might be simple, even plain, but they are often quite delicious. Baccalà lesso, or boiled salt-cured cod, is typical Lenten food. The fish is treated as simply as you can imagine: lightly simmered in plain water, then napped with a light lemon, garlic and parsley sauce that recalls the salsa verde you might serve with mixed boiled meats. In this sauce, however, the saltier elements like anchovies and capers are left out of the sauce, as the baccalà already has plenty of savor. This recipe for baccalà lesso comes from Jeanne Caròla Francesconi’s classic cookbook, La Cucina Napoletana. 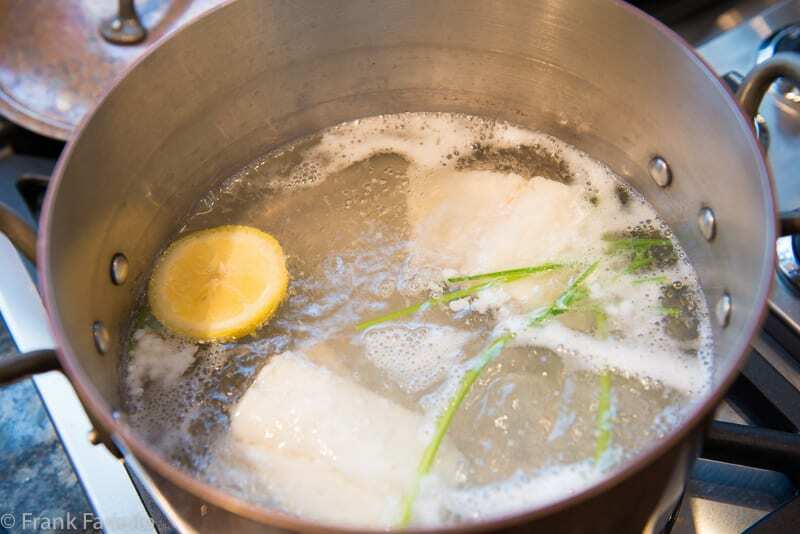 Simmer the pre-soaked salt cod in enough water to cover for 15 minutes. Francesconi calls for simmering it in plain, unsalted water, but I threw in a piece of lemon and a few parsley stems leftover from making the napping sauce (see below). As the salt cod is already salty, this is one case where you don’t need or want to salt the water. Arrange the pieces of cod on a serving platter. Taste a bit of the fish to see how salty it is. Now nap the fish completely with a little sauce you will have made from whisking together the minced garlic, parsley, lemon juice, pepper and—only if the fish needs it—a pinch of salt. Serve still warm or at room temperature, with boiled or steamed potatoes as a side if you like. Once a common and inexpensive food, baccalà has become something of a rarity, at least here in the US. (Cod has suffered from over-fishing, so it is in short supply, which also makes this one-time poor-man’s food expensive, too.) If you do find it, baccalà is usually sold still salted and often frozen, in which case you will need to soak it before cooking. The time this will take depends on how well cured it is. Take a look: it is lightly salted if the flesh still has some spring in it, 8 hours or so should be enough. If it’s heavily salted or very firm and dry, it will need to soak overnight, up to 24 hours or more. The fish will be ready to cook when it looks and feels like fresh fish again, albeit a bit firmer to the touch. No matter how long you soak it, baccalà is still likely to be a bit salty, so as indicated in the recipe, go easy on the seasoning as you cook. A few stores, especially those specializing in Italians or Spanish food items, sell pre-soaked baccalà (bacalao in Spanish) that you can cook with right away. It’s a great convenience. Jeanne Caròla Francesconi doesn’t specify making a sauce from the ingredients, by the way, and many recipes call for topping the baccalà with the chopped garlic and parsley, lemon juice and freshly ground pepper, one by one, then a good pour of olive oil over all—a kind of deconstructed sauce. 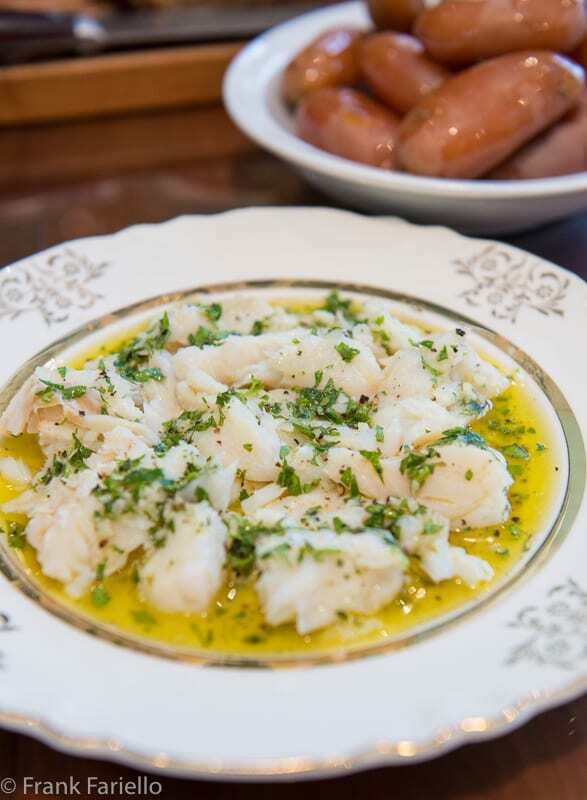 You can also use the boiled salt cod to make a salad: add slices of boiled potatoes to the pieces of salt cod, then mix with a dressing of olive oil and lemon juice, mixing gingerly so as not to break things up. Some recipes call for olives, red onion, celery and/or herbs to enliven the dish. You can leave out the potato for a lighter dish or substitute boiled beans. For more ideas on meatless cookery, check out our fish and seafood and our vegetarian archives, or click on the corresponding tags in the tag cloud at the righthand side of this webpage. Italian cuisine has a wide variety of baccalà recipes, and not just for simple Lenten fare: you may be interested in trying out the lusty baccalà alla napoletana from Naples, or the rich and creamy baccalà alla vicentina from Vincenza, or the luscious baccalà mantecato from Venice. Simmer the pre-soaked salt cod in enough water to cover for 15 minutes. Francesconi calls for simmering in plain, unsalted water, but I threw in a lemon rind and a few parsley stems leftover from making the sauce (see below). As the salt cod is already salty, this is one case where you don't need or want to salt the water. Arrange the cod on a serving platter. Taste a bit of the fish to see how salty it is. Now nap the fish completely with a little sauce you will have made from whisking together the minced garlic, parsley, lemon juice, pepper and—if the fish needs it—a pinch of salt. Hi Frank! Thank you so much for this great site! I’ve spent quite some time looking around at recipes and articles here, and my list of recipes I want to try keeps growing! Since baccalà is probably difficult to find in my country; would you say that your various baccalà recipes generally work with fresh codfish? Anything to keep in mind? Hmmm, that’s a good question, Olof. I’ve never tried substituting baccalà with fresh cod fish but I’d think you could, so long as you bear in mind that baccalà has a more intense and salty flavor and firmer texture due to the curing process. So a recipe like this one, which relies heavily on the flavor of the fish itself, you might find a bit bland made with fresh fish, although you could add more flavor to the sauce with additional garlic and, of course, salt. You would also want to cut down the cooking time. Similarly, filetti di baccalà, which are just fillets battered and fried, could use a little help in the flavor department, perhaps serving it with a green sauce? The recipe for baccalà alla napoletana would likely work very nicely with fresh fish (just reducing the cooking time a bit). On the other hand, I doubt the recipe for baccalà alla vicentina would lend itself to fresh fish. If you do try some of these recipes, let us know how things go! I’m sure other readers would be interested. Thanks for the great reply! I’ll make sure to post here if I try one of the recipes! Well you’ve got a jump on Lent with this one. And what a glorious beauty shot. Bravo! so very delicious and reminiscent of family meals! I usually make something with baccala’ only at Christmas. Don’t ask my why I never think to use it during Lent, but you’ve put the idea in my head. It’s not hard to find it here in NJ. I like the simple nature of this, and it cries out for good olive oil, and/or the sauce you mentioned. I love the simplicity. Lenten recipes allow you to return to just a few ingredients where they meld and satisfy. Plus – it looks so welcoming – a little white winter, a little green spring. But yes, the salted cod in MN is very expensive and we can only get it around Christmas. But I can dream. Our family loved baccalà and it took years before we could find it in the US. When we did it was served at Christmas. It has been difficult to find but for the past two years I’ve found it at Whole Foods. It wasn’t frozen but it was salted and had to be soaked in water. Turned out delicious and we make it a yearly tradition. Your dish looks beautiful and the simplest dishes sometimes have the tendency to be the best. Buona giornata! I agree completely, Marisa! Simple is very often best! I love salt cod, and it’s nearly impossible for me to find. I found a box at Whole Foods in another city once, but haven’t come across it since. Lenten or not, I could eat this all the time!!! Although I’m not a baccalà girl, my parents both love it and still make it. In fact, I have this same recipe and a fried version on my site (both made by my mother)! Shucks, guys, you’re too kind! I’ll definitely check out your recipes, Christina. You do such delicious things with smoked fish there, I have to imagine the salted fish would be equally fine. Frank, I always look forward to your posts – you capture the essence of Italian food and culture so accurately. Pure, clean, basic…essential elements.